Although they’re built with the same bones, the two games included in Roll7’s OlliOlli: Switch Stance are – remarkably – very different beasts. Released barely a year apart, both OlliOlli titles are completely distinct, with their own identities that go beyond surface-level differences and reach down into the roots of the gameplay. They’re as impressive as they were back at release but now, with the Switch-only bundle (if you couldn’t tell by the title), the original OlliOlli and OlliOlli2: Welcome to Olliwood have found their best home yet. Set on a side-scroller 2D plane, OlliOlli is a skating game that plays somewhere between Tony Hawk Pro Skater and endless runner Canabalt. You skate from left to right across its fixed, intricate levels, pulling off tricks to complete level objectives or beat high scores. Your little skater dude is fragile and is wrecked by most falls, necessitating a (painless) restart. OlliOlli’s controls are the highlight, however – still wonderfully intuitive years after release. You pull off tricks through motions on the left analogue stick (or d-pad), similar to moves in Street Fighter. Flicking the stick straight up performs an ollie, flicking to the right pulls off a kickflip and the left a heelflip. The more complex tricks, like a laserflip’s left-to-down-half-circle command, earn more points but are naturally tougher to pull off consistently. Almost every stick turn is attached to a different move, which means that pulling off any trick can feel like mashing directions, and since tricks are easy to pull off individually, OlliOlli focuses on variety. Similar to the style meter in the Devil May Cry series, consistency and variety earns the highest scores. Aside from basic tricks, players can grind on railings, add rotation mid-air, make perfect landings and maintain a combo (multiplying your final score) to earn more points and boost your overall high score. It all adds up to a system that’s fun to come back to again and again, whether it’s to push through the campaign, beat high scores on a Spot or play the Daily Grind. OlliOlli’s campaign is made up of 25 Amateur levels and 25 Pro levels across five themed worlds. Completing any Amateur level unlocks the next, and beating all objectives on a given level unlocks the Pro version of that level. It serves as both a tutorial mode, pushing you to really learn the tricks and their timing to complete the objectives (five per level); and as a pseudo-2D platformer, becoming genuinely harder and more complex over time. OlliOlli also includes 50 Spots, which are each unlocked after beating any level once. Spots make up the arcade mode of OlliOlli, an addictive score-attack mode built for short bursts. They complement the main campaign very well (especially for portable play); where the campaign becomes increasingly platformer-focused and less about free-form skating (this is also true of the sequel), Spots are tight shots of arcade goodness that simply let you skate for high scores, either against yourself or the online leaderboards. Lastly, there’s OlliOlli’s Daily Grinds, Roll7’s answer to the daily modes in Spelunky, Binding of Isaac and all those other popular roguelikes. Randomly selecting one of the game’s 50 Spots, each player has 24 hours to practice the Spot and, with just one attempt, set a score on the daily leaderboard. An indie-jazz-electronica soundtrack rounds out the game, this blend of relaxing, funky tracks (with a couple of faster, heavier tracks) that matches the chilled mood of the gameplay itself. Even at its most hectic, the slow-building grooves of artists like Qemists, Dorian Concept, Flako and DFRNT keeps you centered, motivated and in-tune with the rhythm of OlliOlli’s grinds, landings and constant faceplanting. All of the above also applies to the sequel, OlliOlli2: Welcome to Olliwood, a near-perfect follow-up that builds upon and polishes the foundation that the original laid. With a ton of quality-of-life upgrades and an update to the game’s aesthetic, OlliOlli2 changes the core gameplay just enough that it doesn’t kick the original out of the conversation. In terms of content, OlliOlli2 is largely the same. A career of 50 new levels across five worlds – this time themed after Hollywood genres like westerns and a zombie-fied carnival – 50 Spots, the Daily Grind, the Tricktionary (which, if you couldn’t tell, is the full list of tricks) and the Skatepark tutorial section, the latter two expanded for all the new moves. The only new mode in OlliOlli2 is the Combo-Rush local multiplayer mode. Originally released post-launch on the original Vita and PS4 release, Combo-Rush is a competitive mode for 2 to 4 players. Each player has one try to skate up a level – no practice tries here. First to reach 10, 15, 20 or 25 points wins. It’s a simple competitive mode across four game types that let the gameplay shine and exactly suits the Switch, even played in the cramped tabletop mode. The sequel also brings along a new visual style. While I’m as much a fan of lovely by-hand pixel-art as any other sane person, the flat vectorized imagery combined with the more vibrant colours and level themes in OlliOlli2 is far more pleasing to the eye. OlliOlli2 also brings clearer level elements that’s much appreciated; where the original OlliOlli sometimes makes it hard to figure out if something can be grinded or landed on (especially in the snow levels), this isn’t really the case anywhere in the sequel. With a brand-new soundtrack, Roll7 has the same relaxing chill in the audio department. This time featuring Cid Rim, Lone and Faulty DL, OlliOlli2 keeps it upbeat and mellow. The biggest change in OlliOlli2 is adding manuals as a trick type – basically grinding along the ground – which lets players maintain a combo across an entire level. This changes the game’s dynamic entirely. In the first OlliOlli, you built your combos up as much as possible but only a few levels let players keep a combo alive the entire time. With manuals, the entire approach towards high scores shifts over almost entirely to ending on a high combo score. Improving your skill is largely the same as it was, slowly improving your consistency in pulling off more complex tricks, but it’s now far broader with the addition of manuals, reverts, revert manuals, grind switches and a thoroughly expanded trick list. In a way, the ‘easy to learn, hard to master’ aspect of OlliOlli is pushed far in both directions here. With a focus on combos, high scores are easy enough to earn with any level-long combo, regardless of the tricks. At the same time, the skill ceiling is pushed far beyond where it was in the first game with a far wider range of tricks and an ever-present combo to maintain (for the highest scores at least), which adds pressure to every score run and cuts out any mid-level breaks to catch your breath. Undoubtedly improved and undoubtedly harder, OlliOlli2’s new systems result in a game that’s so different from the original that it isn’t really fair to compare the two. OlliOlli is simpler and, without the focus on keeping combos alive, has its own appeal and rhythm compared to the relatively hectic OlliOlli2. Bundled together on the Nintendo Switch, both OlliOlli games are essentially unchanged from their original releases. Content across both games remains identical and the only Switch-specific changes are HD rumble – subtle and effective – and the use of single joy-cons in OlliOlli2’s Combo-Rush mode. Unfortunately, OlliOlli2 lacks the XL Edition’s Free-skate mode, which remains exclusive to the Xbox One version. Handheld mode lacks touchscreen support, too, but otherwise they’re the same exact games. Just like the other platforms, both OlliOlli games play phenomenally in both portable mode (basically souped-up versions of the PS Vita releases) and docked mode, especially when using a Pro controller. If you missed the boat on every other platform or just feel like revisiting the series, OlliOlli: Switch Stance is likely the best way to do it. The games included in Roll7’s OlliOlli: Switch Stance may be straight-forward ports with a cheeky name, but they remain as phenomenal as they were on release. Two of the best skating games in recent memory by a wide margin, OlliOlli and OlliOlli2: Welcome to Olliwood find their definitive platform on the Nintendo Switch. 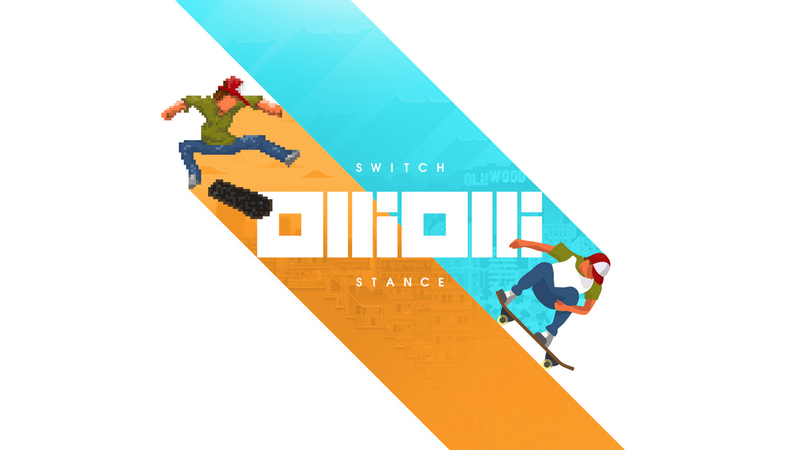 John reviewed OlliOlli: Switch Stance using a retail Nintendo Switch code provided by PowerUp PR.